pet friendly cottages for up to 5 dogs for those who really love dogs. A canine-friendly UK break is very popular with dog owning couples and indeed it can be more difficult to get away unless booking a pet-friendly cottage holiday for two. There are plenty of holiday cottages with fully enclosed gardens and some with optional kennels that make every self-catering break relaxing with dogs. Lots of people head for the coast with their dogs and look for pet-friendly seaside holiday cottages that have a garden, so that people can safely leave their dogs outdoors when not on the beach. Many people prefer to take their dogs on holiday and pet friendly country cottages are in high demand. Dog owners hate the idea of leaving pets behind or at the kennels. Some pets, especially dogs, will grieve for the entire holiday and often sulk for days following your return - and who can blame them! The idea of being able to take your doggie with you to a dog friendly holiday home is an attractive option. A dog friendly self-catering cottage where you can trust that your pets will be made welcome can be a weight off your mind. Dogs by and large are used to travelling with you in your car and can be taken on holiday really quite easily. 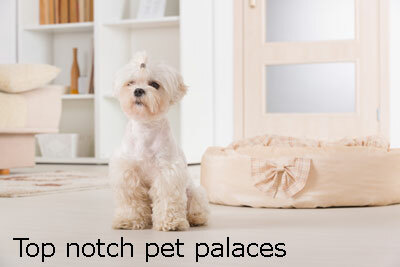 There are lots of pet friendly cottages to rent, some even have swimming pools, hot tubs, saunas and tennis courts. Sizes vary from one bedroom cottages for couples, family sized pet friendly cottages that sleep 6, all the way up to pet friendly mansions. Do your research and find the right quality cottage for you. The lists below are there to help you find a dogs welcome cottage. 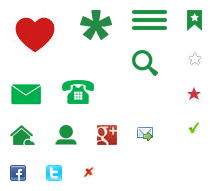 For specific searches do use our search assistant on the right. 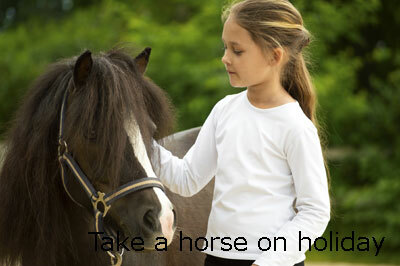 It's not only dogs that need a holiday, if you have a horse you may want to take your animal away with you and by arrangement it's possible at some holiday properties. 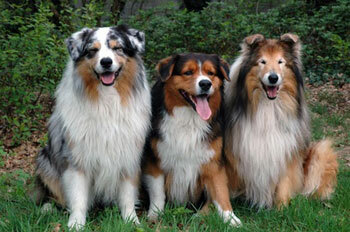 In terms of dogs, some cottages are very pet friendly and allow you to bring a number of dogs on holiday with you. Do check with the owner though for your own peace of mind and security before booking as most cottages are dog friendly by arrangement. Ideally, most doggie owners also require a pet friendly cottage with an enclosed garden so that their dog does not stray during the holiday or at least cottages with a dog run where a dog may be left alone for a short period. Book a property with a garden big enough so you can enjoy playing fetch with your pooch. Lots of couples own a dog and need just a one bedroom pets welcome holiday letting that has its own garden. A small number of cottages have a dog bed provided. 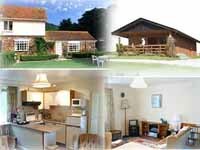 Another most useful facility for people going on holiday and taking their dog is a cottage with an outdoor kennel where the dog may be left for a short time, perhaps whilst holiday-makers go out for a meal or the theatre. Every pampered pooch looks forward to a superior type of self-catering break where the surroundings, welcome and atmosphere are up to scratch. Well bred furry pets have good manners and know how to behave in up-market properties, and expect thick and warm throws over the sofas to provide a comfortable place for an afternoon snooze. Underfloor heating is always much appreciated for tender paws and a log burner is divine. Please point me in the direction of supremely attractive and satisfying dogs most welcome holiday accommodation. There are those times of year when it is good to book a cottage break and escape to somewhere tranquil for a few days. Find out about dogs permitted cottages in less populated parts of Britain. There are some amazing pine lodges to rent in Wales that have a hot tub or jacuzzi and are extremely pet-friendly. That log cabin atmosphere is always welcoming and sets the tone for a really good holiday. 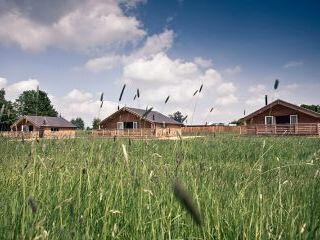 Take a chance on a pet-friendly log cabin break in Wales - this self-catering accommodation offers outstanding value. Dogs allowed holiday cottages for the disabled - to see all accommodation that has various adaptations for people with disabilities generally. It's a pet's life on the west coast of Scotland in Highlands and Islands - view comfortable pet-friendly 5 Star holiday homes, by the water and in the country, which sleep up 2-6 people, with a sauna and jacuzzi for guests. The setting of the holiday houses is most often scenic, surrounded by hills - the west coast of Scotland offers unsurpassed dramatic scenery. There are natural beaches suitable for walkies with the dog and the chance for a doggy paddle. Some of the coastal pet-friendly holiday homes have underfloor heating - very nice under paws! Several small well-behaved dogs accompanied by their owners are very welcome. Find out more about a dogs welcome break in west Scotland. Also, in Argyll, on the west coast of Scotland, Lochead Cottage (sleeps 6) is one of several in this beautiful peaceful coastal area, where you can find total and utter peace and relaxation. This is the ultimate getaway for stressed city folk to a special remote location. Relax and refresh yourself with wonderful country walks with your dogs by the sea and enjoy some tranquillity in this traditional Scottish cottage. Click on the photograph for more information about these comfortable holiday cottages where you can stay with your pooch. If you like to be out and about by the sea, then you may wish to consider pet-friendly holidays near the coast for walks with splendid sea views. If you're thinking of taking a self catering holiday in Cornwall, search for Dog friendly self catering cottages in Cornwall. Find some amazing dogs-welcome holiday cottages in Cornwall. Many have excellent shared leisure facilities including a swimming pool. Some of these quality cottages are pet-friendly. Fido and children welcome in most cottages. Be polite and check out the canine accommodation details before you make that booking. If you are interested in taking your pooch on holiday to luxury accommodation, take a look at our listing of pet friendly luxury cottages throughout the UK and Ireland. The Cotswolds are a much loved part of England. Those honey-coloured stone villages, the charm, prettiness and stunning countryside crossed by numerous footpaths and bridleways is heaven for people who love to be out in the fresh air with their dogs. 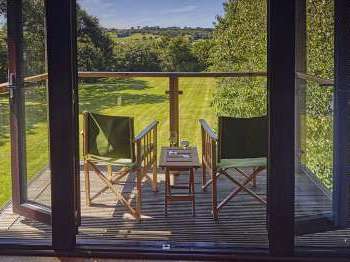 Woodcombe Lodges and Cottages (sleep 2-5) near Minehead in Somerset are set in three acres of manicured gardens in the countryside looking towards Exmoor but only 1.5 miles distant from Minehead seafront with all its attractions. There is lots of space to exercise your dog and wonderful local walks for man and beast. More dogs permitted cottages in the West Country here. The Wst Country is considered by many one of the most welcoming holiday destinations for holidaymakers accompanied by their pets. Whilst in the West Country, take a look at pet friendly holiday cottages in Devon, the neighbouring county. A log fire adds a cosy atmosphere to any holiday home. Try looking at these cosy dogs allowed holiday homes in Devon that have a woodburner or open fire. 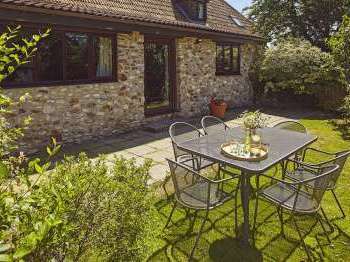 You may also wish to check out dogs welcome cottages in the Exmoor National Park where there are acres of rural wilderness to roam and explore. 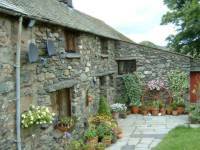 Find pet friendly holiday cottages in the Lake District magnificent views of the Lake District fells and mountains - lots of potential walks and dog-friendly pubs. 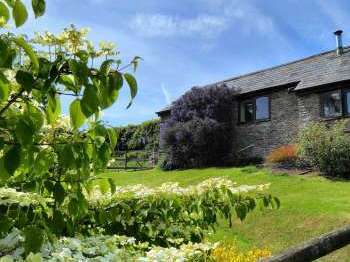 Located in a remote location high up on Birker Fell, in between Eskdale and Ulpha in the Lake District, the House and Cottage can be opened up to form one large house offering spacious and comfortable self catering accommodation for up to twelve people. One feature of this accommodation is the exposed beams and wonderful views towards Scafell Pike from many of the rooms. This house and cottage have been furnished and equipped with care and and thought. Please click on the cottage photo for further details of our pet-friendly Cumbrian holiday cottages and we welcome you and your dog to the Lakes. All pets are welcome at Grove Cottages in Edwardstone near Lavenham, Suffolk. Bring your well-behaved dog, cat or duck - all will be made welcome. The owners of this collection of adorable country cottages have their own menagerie and adore animals. Availability and more details can also be found on The Grove Cottages own website. 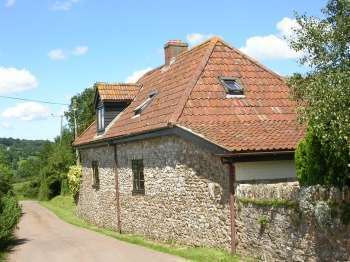 Brackenbury, a historic, Grade II listed cottage is dog friendly. 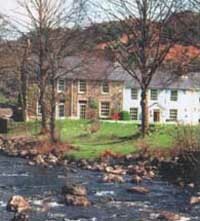 This cottage is located in a pretty village with views of the green and River Glaslyn. What's more, this cottage is in the Snowdonia National park in north Wales. Nearby and around the cottage you will find beautiful mountain scenery. The village, Beddgelert has pretty much everything you should need: a shop, pubs, restaurants and a post office. The cottage – sleeps 4 in comfort and 6 at a push– offers a home from home environment and has many antique pieces. Inside the cottage there is a conservatory – great in the summer, a dining kitchen, shower room, generous living room with open fire, digital TV and hi-fi, and 2 bedrooms (1 of which is a double with en-suite facilities and 1 twin bedroom). The price includes heating and electricity. Please bring own bed linen, towels and tea towels. Parking is available for 2 cars. Please click on photograph for more information and interior images of this canine-friendly cottage in wales. Dog bed provided. Or, a pets welcome cottage in Wales that has a swimming pool. Ireland is a good location for a pet friendly self catering holiday, especially if you live there because travel to your cottage will only necessitate a drive. Visitors from the Uk to Ireland have to also take the ferry, however, many people do the journey accompanied by their canine companions. County Cork in south west Ireland is a grand place for a dog friendly cottage holiday in Ireland, the rugged coastline with cliff walks, dog friendly beaches and acres of countryside are a good pet friendly destination. Pets and travel : There's a lot more to pet travel than popping Rex in the boot of the car or onto a plane. This site offers all the advice you'll need to take your pet anywhere.